Ubisoft has released a new trailer and screenshots for Far Cry Primal, exploring the rival tribes players will be facing off against to secure the safety of his own. In Far Cry Primal players are cast as Takkar, a hunter and last surviving member of his hunting group. Players arrive in an area called Oros with the singular goal of survival. “The majestic land of Oros has been torn apart due to the confrontation of the three dominant tribes who seek the same single purpose: to conquer it,” Ubisoft explains in a press release. “Takkar’s people, The Wenja tribe, is at risk. They are being attacked by both the cannibals of the Udam tribe, led by the cruel warrior Ull, and the fire worshipers of the Izila tribe, led by the high priestess Batari. Ubisoft has also released a second video going behind-the-scenes to show how they brought the game’s setting to life, and how it preserved the DNA of the Far Cry experience while shifting to a new setting. Watch the video below. Ubisoft also previously described the game as a “full-fledged single-player experience,” set in 10,000 BC, at a time when “massive beasts like the woolly mammoth and sabertooth tiger ruled the Earth.” Take a look at new screenshots from the game below. Far Cry Primal is scheduled to launch on February 23 for PS4 and Xbox One. The PC edition will follow on March 1. 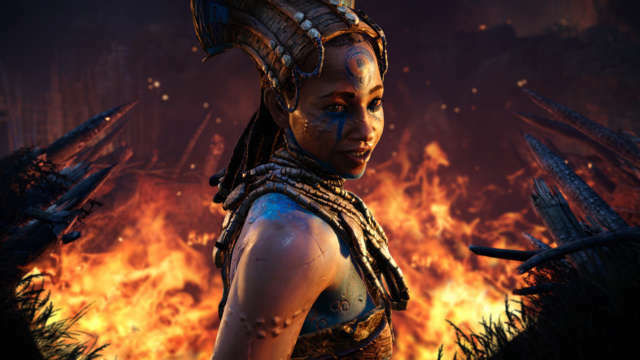 For more on the game, read our hands-on preview of Far Cry Primal.